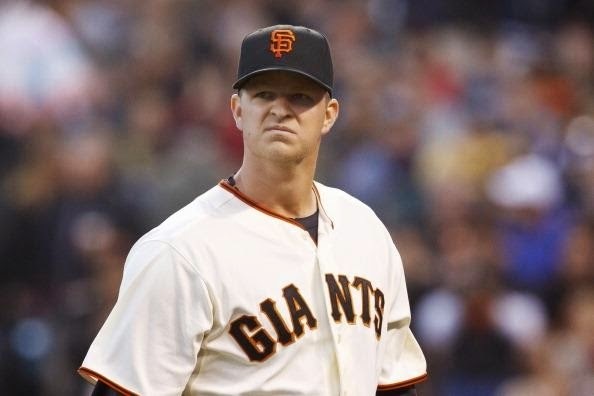 San Francisco Giants pitcher Matt Cain, their 100-million dollar man, does not have a win. He has pitched very well his last three starts, and has not won a single game this season. His ERA is 4.35. He is near the top in four statistical categories (leads the team in innings, 2nd in strikeouts, opponents batting average, WHIP). Yet he does not have a victory. More astounding, the Giants haven't won any of his starts. Since our last look at Los Gigantes, they took two of three from Los Angeles, one of three in San Diego, and one of three in Colorado. Tim Lincecum got his first win, Tim Hudson got his first loss (in a game where the Giants scored only one run, a recurring theme for this team), and Madison Bumgarner threw a nine-hit 97-pitch complete game and lost 2-1. "No, I have no idea what's happening either." A few things have come to light after three weeks, and they are worth noting. 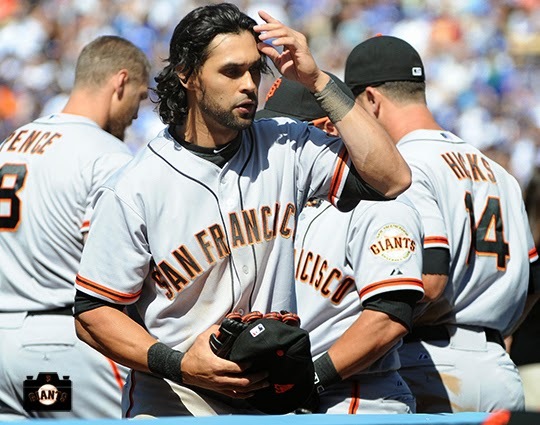 Concern number one, Angel Pagan has a sore knee and was scheduled to get some sort of treatment on the off day. Now, since I'm rather certain that EVERY major league athlete has a sore knee every day, one complaining about a “sore knee” is the normal person equivalent of “uh, do you think we should go to urgent care?” This is not good. Two, I think Ryan Vogelsong is cool for several reasons, (his wife really appears to be cool and has occasionally shared recipes on her Twitter account) but his spot in the starting rotation has got to be hanging by a thread- at best.. He's the fifth starter, and he is pitching worse than you'd expect a fifth starter to do. And that ain't good. Who's at Double-A Richmond who impressed guys in spring training? Give him a plane ticket. Is there a “tweener” in Triple-A who's been tearing it up in Fresno in the early going? You're up, Sparky. Sorry Vogey. It's how it goes. You're not doing what a starting pitcher is supposed to do and you know it. Of course, this is a team that scores two runs or less in six of seven games and then bombs out six homers and 12 runs Wednesday in Colorado, including the first two-homer game from Hector Sanchez- and his first grand slam, much needed considering the Rockies almost came back even from that in the bottom of the 11th. This has been SF's Achilles heel since, well, it was even a problem in the World Series winning year of 2010- That team would have run away with the division (as opposed to having to win it on the last day of the season) and Matt Cain would have destroyed Tim Lincecum in the wins department if he had gotten the run support Timmy did- here, see for yourself. So it's the never-ending problem. Sure, Morse is hitting the ball well and Brandon Belt, while he's cooled off from his torrid start (I do believe opposing scouts have found a flaw in his flue), is still knocking them out. The problem isn't them, it's that they're doing this when there's nobody on base. I know pitchers are more likely to throw “challenge” pitches (aka fastballs in the meaty part of the strike zone) when there's nobody on, and that has plenty to do with this, but come on. The weirdest thing about the Giants offense is this- until Wednesday's 12-run outburst, Angel Pagan led the team in RBI's. Angel Pagan is the Giants leadoff hitter. This means that the guys at the bottom third of the lineup, Brandon Crawford, Joaquin Arias, etc, are getting on more consistently than the guys in the top third of the lineup. "Yeah, and if I do that, then I'll wear a hat sideways. What?" Which brings up a question I've always had- why are lineups set up the way they're set up? With your “typical” run producers in the 3-4-5 spot? And the guys who get on base in the 1-2 positions? Those guys are only guaranteed to bat in that order in the first inning. Tell me why you wouldn't alternate “guy who can get on base” with “guy with out of the park power” throughout the lineup? I understand it might seem weird at first, but wouldn't you really make yourself more likely to score runs that way? If, say, Buster Posey batted second, and Brandon Belt fourth, and Pablo Sandoval sixth, and Michael Morse eighth, then you've spread out the power in your lineup. You can argue that pitchers would pitch around those guys more often... but then if so, then you're walking them, and you've got a baserunner on for Pagan batting third, and Brandon Crawford fifth, etc... and those guys aren't power hitters, they're contact guys. And if you're a pitching staff and you see that Buster Posey is on base thanks to a walk, then you have to pitch to Pagan because Belt is up after him. If Pagan gets a hit, then you have two on for Belt. And then you've forced the other manager to consider when to use his top relievers. They couldn't bring a shut-down guy to face Posey-Belt-Sandoval in a row, because you've spaced them out. Now there are two batters in-between those three guys. Every time I think about this it seems like this would work. It seems like this development would really help out switch-hitters who are contact guys, a guy like Pagan. And it seems like it would really help out a switch-hitting power guy like Sandoval. Somebody needs to try this. 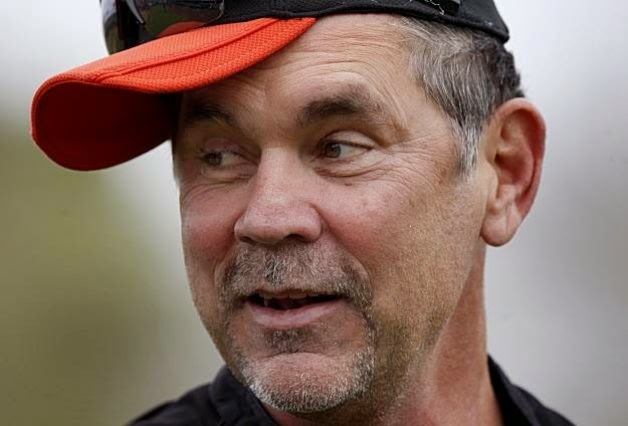 Somebody like Bruce Bochy. Till the next update: three versus the Indians (Duane Kuiper bobblehead night, celebrating the only home run he ever hit in the majors, it was while he was with Cleveland) and three against San Diego- and then it's May!